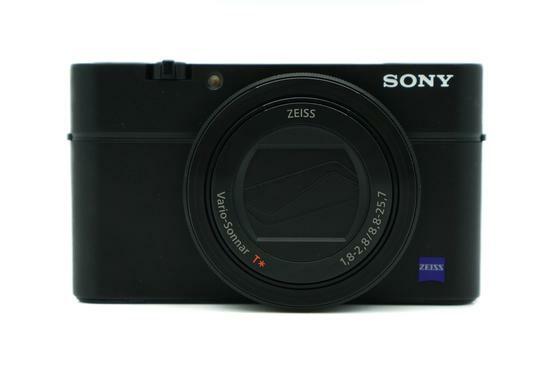 Sony RX100 III camera in great condition, showing only minor signs of previous use. This camera includes a USB cable. wrist strap, user manuals and the original packaging. The Sony Cyber-shot DSC-RX100 III Digital Camera is a versatile and advanced point-and-shoot featuring a large 20.1 megapixel 1" Exmor R CMOS sensor to produce high-resolution still imagery and full HD video. This sensor's design utilizes backside-illuminated technology to improve clarity and image quality when working in dimly-lit conditions as well as increase the sensitivity to a native ISO 12800. Benefitting the performance of this sensor is the BIONZ X image processor, which helps to produce images with smooth quality and tonal gradations as well as provide expedited performance throughout all aspects of the camera, including a continuous shooting rate of 10 fps in Speed Priority mode, shutter release lag of 0.008 sec., and XAVC S movie recording at 50 Mbps. The built-in Carl Zeiss Vario-Sonnar T* 2.9x zoom lens provides a 35mm-equivalent focal length range of 24-70mm, covering wide-angle to portrait-length perspectives to suit working in a wide variety of environments. An f/1.8-2.8 maximum aperture benefits working in low lighting and controlling focus throughout the zoom range. Optical SteadyShot image stabilization is also available to help minimize the appearance of camera shake when working in dimly-lit conditions and with greater zoom magnifications. Furthermore, a built-in three-stop ND filter is incorporated into the camera's design to suit shooting in bright conditions with wider apertures and for greater control over how movement is depicted. The lens also features a Carl Zeiss T* anti-reflective coating, which helps to reduce surface reflections, lens flare, and ghosting in order to produce imagery that is rich in contrast and clarity. Complementing the imaging capabilities of the RX100 III is a sleek body design featuring both an electronic viewfinder and a tilting LCD screen. The 0.39" 1,440k-dot SVGA OLED Tru-Finder has Zeiss T*-coated optics and provides a bright, clear means for eye-level viewing. It features a unique pop-up mechanism that helps to maintain the compact form factor of the camera when carrying or if preferring to work with the rear screen. The 3.0" 1,229k-dot Xtra Fine LCD incorporates WhiteMagic technology for easier visibility in bright conditions and its tilting design permits greater usability from high, low, and front-facing angles. Furthermore, built-in Wi-Fi connectivity with NFC allows instant image sharing to, as well as remote camera control and monitoring from, linked mobile devices. The large 20.1 megapixel 1" Exmor R CMOS sensor features backside-illuminated technology to enhance its low-light capabilities to a native ISO 12800 while still retaining vivid clarity. Using Sony's Column A/D Conversion, images are rendered with impressive image quality and smooth gradations between tones and colors due to the marked reduction in apparent noise. Furthermore, the sensitivity can be extended to an effective ISO 25600 when using Multi-Frame NR, which records and composites sequential images in order to attain high sensitivity with minimal noise. Also benefitting the image quality, as well as overall camera performance, is the BIONZ X image processor, which provides continuous shooting up to 10 fps in Speed Priority Mode, 2.9 fps shooting with single-shot AF, a shutter lag time of just 0.008 sec., and a start-up time of 1.6 sec. The built-in Carl Zeiss Vario-Sonnar T* lens provides a 35mm-equivalent focal length range of 24-70mm, covering wide-angle to portrait length perspectives to suit working in a wide variety of shooting conditions. An f/1.8-2.8 maximum aperture benefits working in difficult lighting conditions throughout the entire zoom range and also enables greater control over focus placement for shallow depth of field imagery, which is further accentuated by a seven-blade diaphragm to produce a smooth out-of-focus quality. Nine aspherical elements, including one AA element, are incorporated into the lens design to minimize chromatic aberrations throughout the zoom range to benefit creating sharp, clear imagery. The lens also features a Carl Zeiss T* anti-reflective multi-layered coating to help minimize lens flare and ghosting in order to produce imagery with rich contrast and color neutrality. Benefitting the 2.9x reach of this lens, as well as supporting working in difficult lighting conditions and with longer shutter speeds, is Optical SteadyShot image stabilization, which helps to offset the effects of camera shake. When recording movies, the image stabilization utilizes an Intelligent Active Mode, which also uses electronic image stabilization to compensate for both camera shake and rolling shutter effects. Additionally, a neutral density 0.9 filter is incorporated into the camera's design, which provides a reduction of three stops in exposure to enable working in bright conditions with wider aperture settings and for greater control over how subject movement is rendered. Within the compact design of the RX100 III is both a high-resolution electronic viewfinder and a large rear LCD monitor. The 0.39" 1,440k-dot SVGA OLED Tru-Finder EVF provides a bright, clear means for eye-level monitoring, which is well-suited to critical compositions and working in bright conditions. It features 100% frame coverage, a unique pop-up mechanism, and a Zeiss T* coating on the optics to reduce surface reflections and flare for enhanced visibility. Alternatively, a 3.0" 1,229k-dot Xtra Fine LCD screen is also available and features a tilting design (180° up, 45° down) to benefit working from high, low, and front-facing angles. WhiteMagic technology has been applied to the LCD's design, too, to increase effective brightness for easier viewing in bright lighting. Full HD 1920 x 1080 movies can be recorded in the high-quality XAVC S format, which uses MPEG-4 AVC/H.264 video compression and linear PCM audio compression, and saves within the MP4 container format. These compressed files permit recording times up to 29 minutes while allowing 50 Mbps video recording at 1080/60p, 1080/30p, 1080/24p, and 720/120p frame rates. Additionally, movies can also be recorded in the AVCHD format, which is ideal for HDTV playback and Blu-ray disc burning, and the MP4 format, which is ideal for uploading online. Benefitting advanced video applications, the RX100 III also supports clean HDMI output for recording uncompressed video via an optional external recorder and for real-time viewing on an accessory monitor. Recording frame rates include 24p, 60p, and 60i, and the shooting info display can be turned off during recording for a cleaner view when utilizing an external monitor. A contrast-detection autofocus system works to acquire precise focus using single-shot or continuous AF modes. When working with moving subjects, Lock-on AF, with wide, center, and flexible spots, adjusts the target frame size as the subject moves throughout the image frame. Face detection and face registration technologies can be used to base focus on recognized faces and Eye AF is also available, which is a detail-oriented focusing function that prioritizes and dedicates focusing performance on a subject's pupil for sharply-rendered portraits. For manual focus control, DMF (Direct Manual Focus) and standard manual focus options are available. Benefitting precise manual focus, focus peaking can be used to highlight edges of contrast within the frame for a more objective means of determining critical sharpness. A zebra function can be used for easier detection of exposure clipping to prevent overexposure. A digital level gauge detects pitch and roll types of movement and helps to produce even, consistent horizons and plumb verticals. Multi Frame NR records consecutive images at a reduced ISO sensitivity and then composites them into a single image to realize higher effective sensitivity (up to an equivalent ISO 25600) with minimal image noise. Standard image compositing is comprised of four exposures and High image compositing utilizes 12 distinct exposures. Creative Style settings provide control over how the camera processes images based on different predetermined styles: Standard, Vivid, Neutral, Clear, Deep, Light, Portrait, Landscape, Sunset, Night Scene, Autumn Leaves, Black & White, Sepia, and Style Box. Within these settings, contrast, saturation, and sharpness can also be adjusted depending on personal preference. To extend the effective reach of the optical zoom lens, Clear Image digital zoom can be used to intelligently magnify scenes up to 5.8x at full-resolution. This digital zoom technology uses an intelligent interpolation process to minimize the amount of image degradation in order to produce realistic, high-quality images. In-camera creation of 4K slide shows is possible for rich playback to ultra high definition televisions. An HDMI port is incorporated into the camera's design, too, to enable direct connection to HDTVs. TRILUMINOS Color support is supported to produce rich, natural colors when imagery is viewed on a TRILUMINOS Display.